The purpose of the article is to analyse the principle of gender equality laid down in the interwar Estonian constitutions and to study the relevant court cases at the highest level of appeal in the Supreme Court of the Republic of Estonia (1920–40). When Estonia granted equality rights with the constitution of 1920 and all citizens, men and women alike, were declared to be equal before the law, it placed Estonia among the vanguard of nations in Europe in support of gender equality. The amendment of the constitution in 1933 left the equality principle unchanged. In the new constitution, which went into effect in 1938, gender equality was extended to relations in marriage as well. In the twentieth century, the focus was not on the equality of genders as such, but rather on women’s equality compared to men, and the main question was how to improve women’s rights to gain the equality promised in the constitution. On 1 September 1924, the Grand Chamber of the Supreme Court made a judgment which could be considered the first important court case about women’s rights in Estonia. The Supreme Court issued a complaint submitted by a female lawyer, who challenged a lower court judgement that she – as a woman – was not suitable to be appointed to the position of judge candidate. According to the Supreme Court, the only constitutionally uniform solution that would support gender equality was that all persons – men and women – on the same grounds had the right to become a judge candidate and enter the judiciary in Estonia. 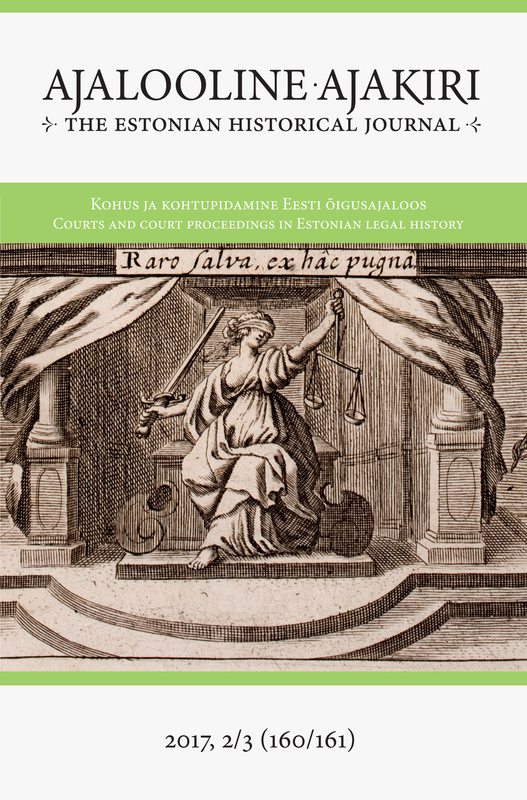 However, the court system of the interwar independent Republic of Estonia remained traditionally masculine without any female judiciary, which is in turn indicative not so much of legal, but rather of pragmatic questions about social attitudes. The exploration of tensions in society engendered by the ambition to bring women into positions of authority and to grant women rights in the private family sphere as well, leads to two main conclusions. First, despite the formal equality that was granted by both constitutions of the Republic of Estonia adopted in 1920 and 1937, women’s efforts, e.g. opening the judiciary to women, were met with a degree of ironical resistance, and general emphasis on women’s rights even drew attention to presumable positive discrimination as well. Estonia’s foreign minister Ants Piip wrote an article in the magazine Constitutional Review about the first constitution of the Republic of Estonia in 1925: “It is interesting to note that despite this provision, many laws exist which protect women in industry, thereby discriminating favourably against men.” Since both the 1920 and the 1937 constitution granted gender equality in public, not in the private sphere, the traditional gap between women’s legal position and that of men generally remained unchanged in private family law. Thus, the Civil Chamber of the Supreme Court of the Republic of Estonia confirmed in 1937 that it was in accordance with the principle of gender equality to restrict the possibilities for married women compared to men to make a testament without any mandatory advisor. According to the court’s reasoning, the regulation was constitutional because the law of succession and the right to make a testament belonged not to the public but to the private sphere. Thereafter, female lawyers drew attention to the fact that a married woman could legally become a judge or a minister – at least it was not prohibited or excluded – and decide the fate of a nation, since this right belonged to the public sphere. And still at the same time, a married woman’s competence to transact in the private sphere was limited compared to men. However, the constitution that went into effect in 1937 brought some changes, since equality in marriage was additionally granted, for instance. Unfortunately, the implementation period of the new constitution was limited to about two years, thus there is no case law to confirm that the constitution brought specific changes in practice.